Sometimes we have retired show cats who are looking for their forever home. 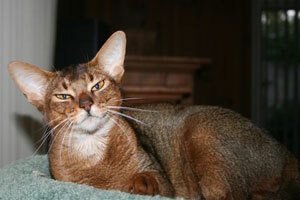 If you are interested in offering a wonderful, inside home for a special Abyssinian, please email us and tell us a bit about yourself. Judy has produced some exceptional kittens in her last three litters. 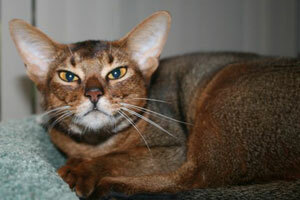 In recognition of her stunning kittens she was awarded the title of Brood Queen of the Year with both the Abyssinian Breeder and Abyssinian Cat Club of A'Asia. Judy has more than 5 offspring currently on the show bench, of which all have taken out many Best in Shows. An exceptional cat Judy is currently available for adoption, preferable an older couple that will treasure this soft hearted Aby who has made so many people happy with her offspring. If you'd like to give Judy a home please contact us.